Confronting an individual resident in the Nigerian Islamic Republic with a question about the country, he/she will advance reasons why Nigeria is unworkable but the same person will turn around to cast his/her vote for political fraudsters that never make good their promises. They will be voted into positions of leadership with the primary aim of ripping off the people of the very basic necessities of life and the benefits of the rule of law as embedded in their fundamental rights. Chronicled records of past governments have confirmed age-long institutionalized trend of inconsistency in policies and implementations of manifestos and constitutional duties. If these identified government ills have remained persistent over time, there is absolutely no conviction to sane minds that participating in the election of another set of political criminals today, whose primary interest is to loot the treasury will be of any benefit. Most of these politicians that we previously drummed up support for, turned out to be the same crop of individuals that we are presently in desperate need of chasing out of office for dereliction of duties. If experience is really the best teacher as it is commonly said, why then have electorates both within Nigeria and Biafra territories not find it necessary to have learnt enough lessons? The Indigenous People of Biafra (IPOB) worldwide, ably led by Mazi Nnamdi Kanu have uncompromisingly resolved to completely boycott the Nigerian government organized presidential election fixed for Saturday 16th February 2019, to change the course of our destiny. Doubtlessly, previous elections may have been boycotted with Nigerians pretending about their effects but this upcoming civil action by the IPOB across Biafraland on that day, will be exceptionally monumental. The United Nations, European Union, African Union, other relevant world bodies and governments of respective nations have graciously given positive nods to 16th of February 2019, as Biafra referendum date. It is a date to remember in history as Biafrans in the old Eastern region and elsewhere, will massively and tenaciously decide their fate as a people whether to remain in or exit the Nigerian contraption. Referendum can be conducted in various shapes and forms depending on peculiarities. It can be by balloting in which the people openly and freely queue up to vote. It can also be carried out by the people by totally boycotting an election organized by any oppressive government through a Sit-At-Home exercise. The leadership of the Indigenous People of Biafra (IPOB) globally, in it's wisdom, has decided that total and complete boycott of the Nigerian government organized presidential election taking place on Saturday 16th February 2019, is the best option in the now. 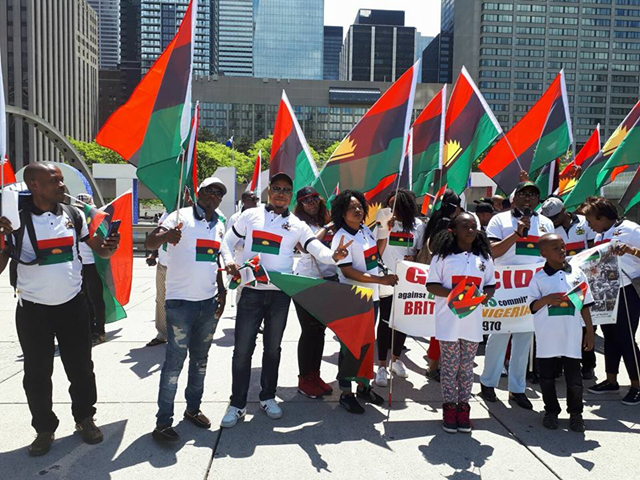 It is quite strategic and affords Biafrans especially residents in Biafraland who have over the years, suffered enormous amount of heinous treatments in Nigeria, to clearly state their resolve before the global community. It is a day of total lockdown in Biafraland as Biafrans observe a Sit-At-Home and get themselves, loved ones and friends, treated with Okazi soup and other varieties of Biafran delicacies till the Nigerian criminal and self-deceit selection process gets over. Several foreign observers from across the globe, are already in Biafraland to monitor the level of compliance to this all important project for our freedom. This is the only civilized route to take if we must end the relentless wave of intimidation, torture and killing of Biafrans by the Nigerian security forces. This is the only way to call it quits with the Nigerian institutionalized fictitious and deceptive political manifestos. This is the only option to the maladious record of dilapidated roads, lack of electricity, dysfunctional hospitals, poor educational system, non-provision of basic social amenities, etcetera. This is the only answer to better and fulfilling life for you as a Biafran individual and for generations yet unborn. In an independent and egalitarian Biafran nation, all natural resources will be judiciously explored and managed to the benefit of the host communities principally, with defined tax percentage paid to the federation account quite opposite to what obtains in Nigeria. Representatives of all Biafran tribes it must be noted, will converge as brethren, to draft and determine acceptable/workable national constitution for the people. Such that will enhance national cohesion, development, equity, justice and freedom. It is time unite, our natural locations notwithstanding, for we are one and same culturally, traditionally and religiously. Let us play the men for our God. We must synergize and chase away these Islamists and their sponsors from our land.